"Justaduck" Wins The $150,000 Tune Up! After more than 11 hours of play, XL Inferno #10 - $150,000 Tune Up finally crowned a winner. "Justaduck" from Switzerland claimed the victory and the first prize of $28,819 after beating "1majomf_sz" in the deciding heads-up. The event, with a buy-in of $160, saw 744 players register and those players made 303 rebuys to get a total amount of 1,047 players. They created a total prize pool of $157,050 with 99 places paid. It took a while to get the money but in the end, "1LevelAbove" was the last player finishing empty-handed. After making the money, it took a long time before the tournament got down to the last nine. After 10 hours, the remaining nine players made the final table and went on to play for a $28,819 first prize. For "77kol0bok77" (ninth - $2,042), "LuckyBoss" (eight - $3,455) and "omnomonoomn" (seventh - $5,026) it wasn't a big success on the final table, because they left quite early. Not much later, "nlfreddie" finished in sixth place for $6,596 after losing all his chips with ace-queen against pocket aces. He or she was followed to the rail by "ShipGold" (fifth - $8,167) and "im_a_luckbox" (fourth - $11,700). On that moment, "Justaduck" dominated the tournament. He took a commanding chip lead against his two opponents and won almost every pot he played. "LivinThDream" was busted by the chip leader and had to settle for third place ($15,548). It didn't take much time to get a final decision, because the heads-up was done within ten hands. 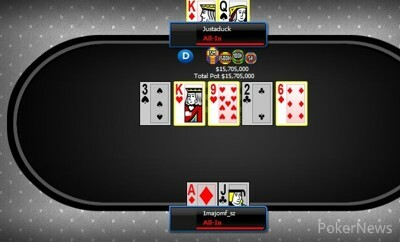 In the final hand, "Justaduck" hit a king with king-queen against ace-jack to receive the first prize of $28,819. "1majomf_sz" had to settle for second place and a prize of $20,574.